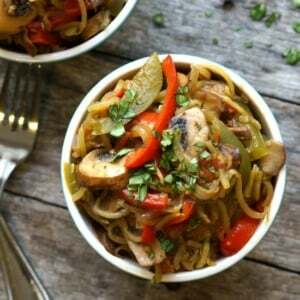 A light, yet spicy noodle dish featuring nutrient rich vegetables. Create zucchini "noodles" using a spiral slicer or a julienne peeler. Place the noodles in a large mesh strainer, and sprinkle generously with salt. Toss the noodles well, and then allow them to sit in the strainer over a bowl to catch the moisture they release. Set aside for 30 minutes. Melt the coconut oil in a deep skillet or dutch oven over medium heat and saute the sliced onion and peppers until slightly tender, about 8 minutes. Add the mushrooms and tomatoes, and saute for another 5 minutes. *If you want to add any additional protein, I'd add it with the mushrooms and tomatoes to cook thoroughly. Once the zucchini noodles have sufficiently sweated, rinse them well with water and pat dry with a towel. Add the noodles to the sauteed veggies, along with the Cajun seasoning, and stir well. (If you don't care for spicy food, I'd recommend starting with half the amount of seasoning called for-- this dish is very spicy as written!) The noodles should be soft after just 2 to 3 minutes of cooking. Season with salt and pepper to taste (I added an additional 1/2 teaspoon of salt) then serve warm. While this recipe contains quite a few veggies, they are all pretty low-calorie so this recipe only serves 2 adults in our home. Leftovers can be stored in a sealed container in the fridge for up to 3 days.